nor for the prospect of resting from my labours. so that I might see Jesus. Please help me, that this would be my chief longing. So, we have the ten commandments. The first four are about loving God with all our heart, soul, mind and strength. Then the following six are about loving one another. God first, and then the people. Notice then, the Lord's prayer. God first, and then the people. And the plurals us and our are key words, which show that we are meant to make this prayer for other Christians besides ourselves. 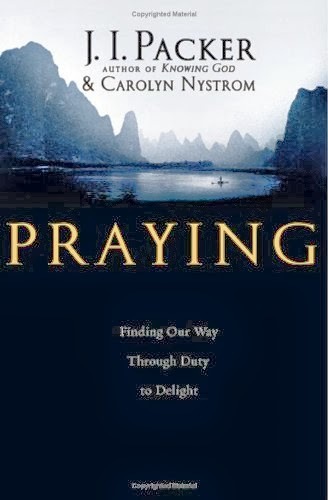 In their book Praying, JI Packer and Carolyn Nystrom quote three passages from John. Does God really give us a blank cheque? What is the message here? Is Jesus giving his first disciples (and us with them) a blank cheque? An invitation to write in whatever amount, so to speak, for whatever we want or think we want - and God will make it happen?... The thought from the text is that we should ask God for things that the Lord Jesus will also ask for on our behalf. We are to make requests to the Father that the Lord Jesus will back. Jesus will associate himself with us in our requests when our requests match what he wants for us. That is the meaning of asking hi his name. Jesus looks forward to his disciples asking for things that can only become a reality with his help and by his power, and that will make for his glory when they do. That is what it means to ask according to God's will, the will of the Father which the Son knows and does. Incline my heart to your testimonies, and not to my selfish gain. Good praying is at once both duty and delight, but often we must begin where prayer is primarily duty. As we grow in the knowledge of prayer and in the practice of praying, however, God will sanctify our efforts and delight will come upon us. From Praying by JI Packer and Carolyn Nystrom, page 10. 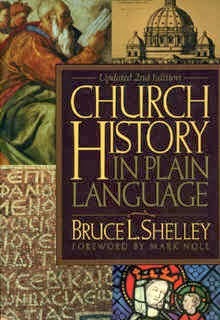 I was speaking to a friend about church history books the other day, having recently finished Church History in Plain Language by Bruce L. Shelley. She commented that she's never really wanted to read a church history survey because they seem like a litany of bad, sad and sorry situations. And in a sense she is right. There is a lot that is grim about church history. And yet, in every bad and sad situation we find a man or a woman of faith who stands firmly, courageously, faithfully and steadfastly for what is Right. That is, we see God at work in and through His people. It is the unfolding of the unstoppable gospel. And so the there is a lot that is inspiring in church history. This particular rendering of church history is a great read. Shelley is a man who clearly loves God and his writing is very pastoral. He spends plenty of time explaining the contemporary significance of church history. This is extraordinarily helpful, making this book so much more than a list of dates, names, places and events. Being just a single volume, he skips through events reasonably quickly. The upside is that he doesn't get bogged down, ever. The downside is that at times, it may be just a little bit sketchy in parts for church history novices. However his writing is clear. And in my view he presents the clearest explanation I've read of the last six hundred years, where things do get quite complicated. I understand the events of these times - and therefore what is happening in our own era of church history - so much better now. Thank you Dr. Shelley. The chapters are short (yay!) and there are good tables, maps and diagrams. This is a worthwhile read, at so many levels. And here are five good reasons to read a church history book. Everyone should read at least one in their life time. We love to do these jobs, grotty as they are, because doing this sort of work together is a bonding experience. More so, it gives us an opportunity to serve the community. We try to do the work joyfully and properly. It's a great gospel opportunity. And I am personally glad to do this work. Until this year I have been on the table cleaning roster. Sometimes I've received a warm comment of appreciation. Most people just ignore us and get on with their eating and having their fun. Lots of people leave their dead chips, hamburger mess, soggy serviettes and other rubbish on the tables, even though there are rubbish bins just three steps away. Once someone saw me cleaning the table next door, swept all of their rubbish from the table onto the ground and said to his buddies, "That's OK...she'll pick it up. It's her job." This year I was on the toilet cleaning roster. We keep on the go. Each block of toilets is probably cleaned once every half hour or so...so they don't ever get too bad. But cleaning high use public toilets is never going to be all that much fun. I am glad to do these jobs at the show. I am glad because I only have to do them for a few hours once a year. But every year it reminds me that there are wonderful people in our community who do awful jobs like this every single day. They do grotty work and are ignored at best, more often though treated poorly. This weekend I have been reminded to be grateful, show gratitude whenever the opportunity arises and live considerately. There are people in our community who serve us in unbelievably kind ways. I realised late in my teenage years that I couldn't put my confidence in the things of this world. People let us down and work, achievements, wealth, experiences, possessions, even our health won't always meet our needs or be 100% reliable and trustworthy. If I have learned anything from the Bible it's that my greatest need though, far beyond anything else I have mentioned, is to be in right relationship with God and that I can put my complete trust in Him in all of life's circumstances, now and into the future. Do you ever feel let down by the things of this world? But it is a rare day that someone does actually ask the question, "Can you tell me about the hope you have?" Even so I've been encouraged recently to think that this doesn't need to be a rare event. Some of us at church have just done a three week course called Just Start Talking and it's a gem. It's about how to just start talking - about Jesus. That it is God's work to save people. That we just need to be people who are, not people who do - that is, we're not about doing anything special or particular but simply living out our lives as children of God. That it can be scary to talk about Jesus - but we don't need to have a theological degree under our belts before we do. We just need to talk about our own experience of living life as one of God's children. Ideas on how to introduce our faith into all sorts of conversations. Ideas on how to encourage conversation rather than kill it. Ideas on how to build in an opportunity to meet again to continue on the conversation. Just Start Talking is very much about sharing Jesus within the context of relationships in a way that honours and brings life to those relationships. One of the exercises across the weeks is to write your own story without any jargon in about 100 words. The Just Start Talking schema is to say why you are a Christian, give a brief explanation and then finish with a question. It's not about writing down your whole story and finishing it off with a summary of the key points of the gospel. That would be a monologue - a very long one in some cases - met with yawning, eye rolling and maybe the end of the friendship. You can't say much in 100 words at all. But that's the point. It's meant to be the beginning of a conversation. It's about a minute's worth. Finishing with a question opens up the conversation. Or it may be that something you have said - because you can't go into much detail at all in 100 words - triggers a question. You know, something like, "What did you mean by...?" There is much to love about this course. It's fun (Colin Buchanan is one of the presenters on the DVD), it's not at all scary (I did it with a couple of quite timid people who are completely pumped), it can be done in three weeks and it's immensely encouraging. 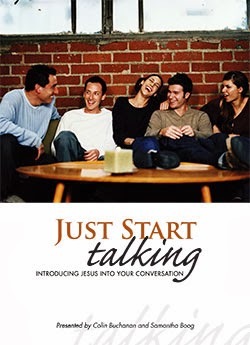 Just Start Talking is an encouragement to live a life that reflects a relationship with God, to pray for those who don't know Him and to just start talking about the things that are so very important. And the thing that encouraged me the most was the idea that if I become known as someone who tries to introduce Jesus into my conversations on a regular basis then at some stage someone probably will ask the question..."Can you tell me the reason for the hope that you have?" Reading: the last bits of Isaiah and the Pauline epistles, the 70s Psalms and Proverbs 24 in my Bible reading. At the beginning of September I was falling badly behind on my reading plan (which may or may not have something to do with Ms Austen...) so I gave September over to double and sometimes triple readings and got myself caught up again. That included reading Job in fairly large chunks. I have to say that for the first time in my life I started to get Job. Maybe it was because I have been thinking a lot about the godly response to suffering in recent years. Whatever it was, this year instead of enduring this part of the Bible I was completely swept away by Job and his godly response to his suffering at least. Not sure I have nailed his friends yet. Maybe next year. Also reading: Church History in Plain Language by Bruce L. Shelley. I was up to "The Age of the Christian Roman Empire" - roughly 300 to 600AD. But this last week I have zoomed to the last three centuries in order to brush up on the rise and fall and rise and fall and so on of evangelicalism, liberalism and fundamentalism in order to help a friend with Church History assignment. This is a great book. No doubt I shall tell you all about it in time to come. Came upon: Isaiah 57:1 once again a couple of days ago. that the righteous are taken away to be spared from evil." So often we don't understand this. It is a thought worth pondering awhile. 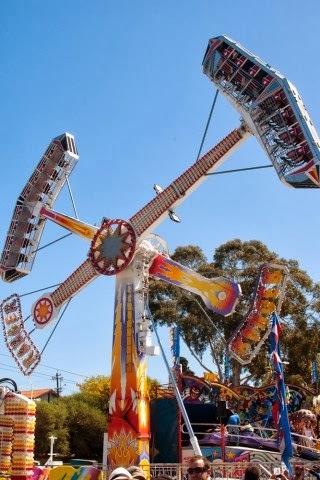 Looking forward: to taking our kids to the Royal Show for the first time in their lives later this week. I haven't been since I was a teenager. Fun fun fun. Also looking forward: to a trip to the symphony next week with a dear friend. Stepping down: from a committee I have served on for the last ten years later this month. I have a few bits and pieces that need finishing up but that will taper off some time into next year. I don't leave this committee lightly or easily but current life circumstances have made it a necessity. Thankful: to all who do their Book Depository shopping via this blog. Thank you, thank you, thank you. Through the commissions I have received I've nearly saved enough to buy the women I read and study the Bible with during the week a Jerry Bridges book for Christmas...but shhhhh...don't tell them... Keep buying those books. Enjoying: a bit of conversation with fellow bloggers via email lately. Nice to chat a bit deeper than comments on a blog post allows. Signing off: because it is time to head out with the boys and a couple of their friends for today's school holiday adventure. Have a good day everyone.